In the pursuit of alpha, there are few predictive factors more significant than insider transactions. No one knows a company’s prospects or product better than its leaders, whose trading activity provides powerful return signals. Understanding which key players are the best indicators of growth and which transactions are relevant can mean the difference between portfolio performance and losses. Click here to learn more about the predictive power of insider transactions. 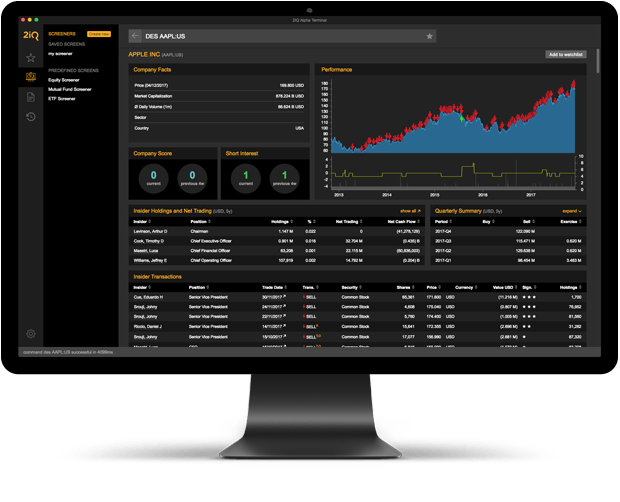 Lists insider transactions and directors dealings data for over 60,000 stocks – all delivered via a customisable feed seamlessly integrated with client-side applications. Integrates 2iQ data directly into your application. The API understands Bloomberg Open Symbology, Thomson Reuters PermID / RIC, and various other ticker symbols. Our quantitative model output, with predictive scores reflecting 2iQ’s unique analytical and statistical capabilities. Click here for more info. Our best data and analytics bundled into one offering. Analytics on insiders, short interest and other data. Launching soon: contact us to join the beta release. An easy way for fundamental managers to leverage their existing portfolio spreadsheets and combine them with 2iQ insider intelligence. Leverage our experience for customized, research-based solutions to your investment strategy. Customized emails for your universe and alerts for dealings in your watchlists. With over 15 years experience, 2iQ draws on deep industry knowledge and cutting-edge expertise from leading investment minds to create the most comprehensive, compelling combination of insider transactions data and analysis for the financial sector. We combine an automated data collection process with appraisals by analysts trained in the specific nuances of insider transaction data to ensure unparalleled quality of information. Our systems are refined to capture filings faster and more efficiently than any other player in the market. 2iQ provides the most complete insider transaction historical data set in the industry. Our database contains 8.1 million transactions from over 200,000 insiders across a universe of over 60,000 stocks in 50 countries with an average history across all regions of 12 years. Founded in 2002 by Patrick and Robert Hable at the Frankfurt University business incubator, 2iQ Research GmbH became the leading insider transaction data provider with a global coverage of over 60,000 stocks. Our clients range from top hedge funds to quantitative portfolio managers and asset managers. Our offering includes a data feed, API, customized services and advisory. We are a cloud-based data and analytics provider, specializing in smart, efficient capturing and processing of company filings and data. Our proprietary technology includes machine learning and smart scraping – as well as an international team of expert data analysts.